A glance at tabloid headlines reveals that we have an almost insatiable desire to see into the future. In our search to know what is to come, many turn to the Bible for answers. Both the Old and the New Testament are loaded with prophets and prophecies. Who were these people who supposedly could predict the future? Have their prophecies come true? Now readers can get to the bottom of 60 crucial Bible prophecies quickly and easily with A Concise Guide to Bible Prophecy. This accessible handbook will help readers understand prophecies within their biblical context and avoid common misinterpretations. Author Stan Guthrie explains what each prophecy meant to those who first received it, summarizes what it means for us today, and provides verses or passages for further individual or group study. 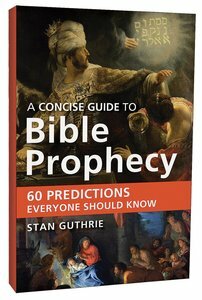 About "A Concise Guide to Bible Prophecy"
Stan Guthrie is an editor at large for Christianity Today. An award-winning veteran journalist, author, and commentator on the evangelical scene, he has edited or cowritten a dozen books including All That Jesus Asks: How His Questions Can Teach and Transform Us. Guthrie lives in Illinois.